Philips Sonicare AirFloss is an innovative interproximal cleaning device that uses advanced air and micro-droplet technology to gently and effectively clean where brushing can't. It can be used with water or mouth rinse for a refreshing clean, and removes up to 5x more plaque than manual brushing alone. For patients who don't floss regularly or at all, AirFloss is an easy way to start a healthy new routine. In a study of inconsistent flossers, after 3 months, 96% of patients continued to use AirFloss 4 or more days per week. 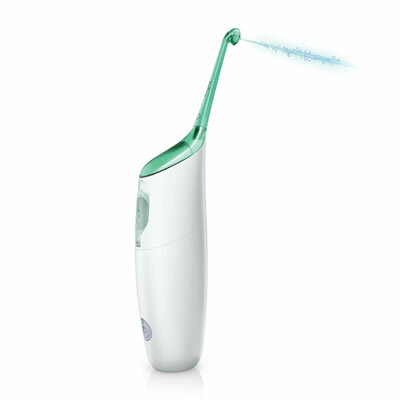 Sonicare AirFloss is simple to use even one-handed, and has a guidance tip to ensure proper placement. And with the new auto-burst feature, the patient can clean their entire mouth in just 30 seconds.